Women are not well represented politically. They hold only 21.9% of positions in national parliaments worldwide. There are also very few female mayors: in most regions in the world, fewer than one in 10 cities has a woman as a mayor. The world’s most powerful companies are mostly run by men. There are only 26 female CEOs in this year’s Fortune 500 companies, and only 54 in the top 1000. Women currently hold 5.2 percent of Fortune 500 CEO positions and 5.4 percent of Fortune 1000 CEO positions. 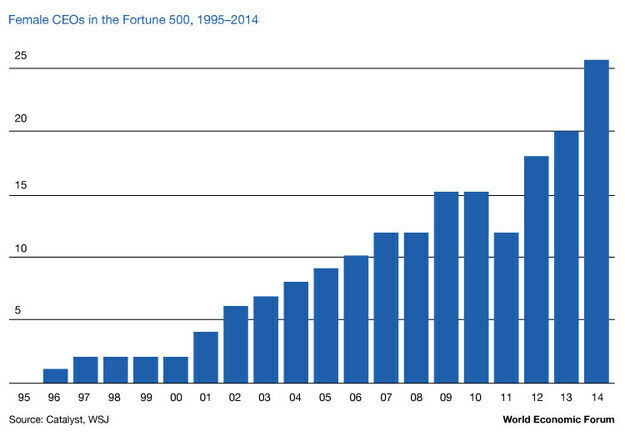 This is low, but at least it’s a steady increase from 1995, when there were no women CEOs in the top 500. There are also more men university professors. In the United States (home to 46 of the world’s top 100 universities), women represent 41.8% of all full-time faculty. 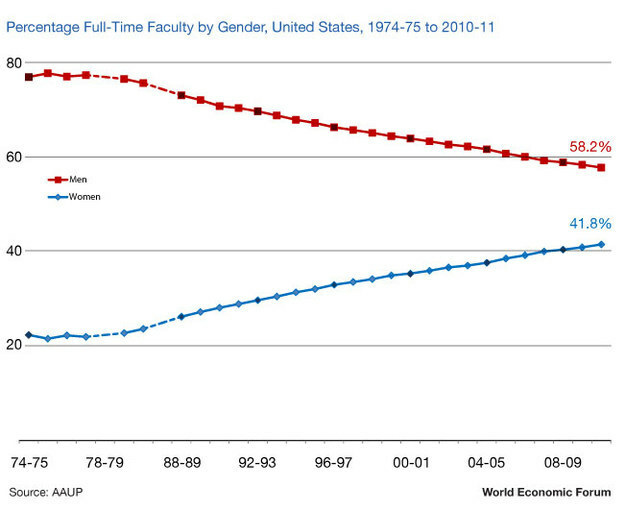 Despite nearing equality with men in full-time faculty positions, women are still seriously outnumbered at the top. In 2009, Only 28% of all full-time professor appointments were women and in 2010-11, women professors were paid 12% less than their male counterparts. Women are underrepresented in the finance industry, too. 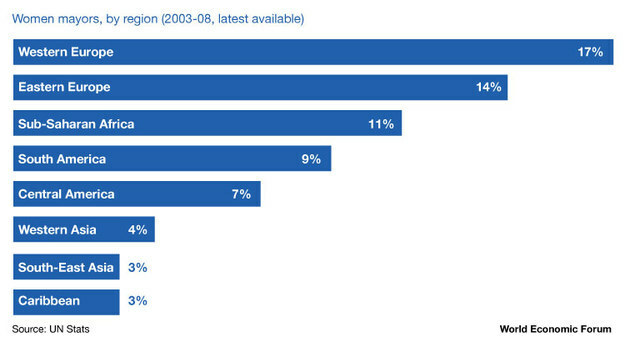 Only 11.4% of CFOs in 2013’s Fortune 500 were women. It may be obvious by now, but one of the reasons there are so few women in positions of power is because of a worldwide gender gap. No country has yet to close this gap. 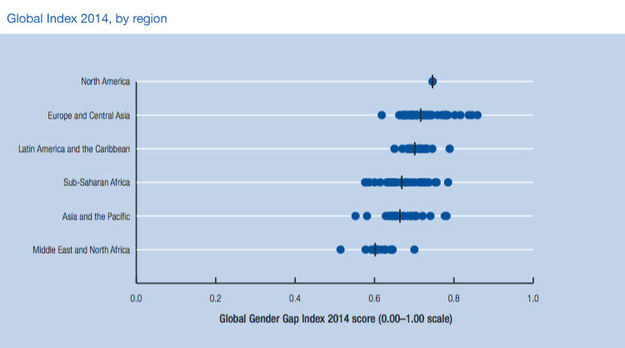 The World Economic Forum’s Global Gender Gap Report 2014 breaks down where countries rank on the Global Gender Gap Index. In the graphic above, 1 means no gender gap. 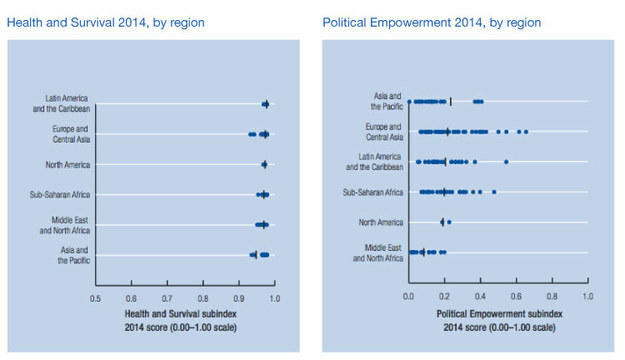 While most countries have nearly closed the gender gap in health and survival, there is still a long way to go for most regions when it comes to political empowerment. The 2014 report does note, however, that of the 111 countries covered since 2006, 105 have been making progress. All of the charts featured in this blog post are from The World Economic Forum’s Gender Gap 2014 report. Author: Saadia Zahidi is senior director and head of the World Economic Forum’s Human Capital and Constituents and Gender Parity programs.